When manufacturing raw food products, sanitation is the key. With many standard conveyors, it’s easy to keep the top surface of the belt clean, but sanitizing other areas of the belt can prove difficult. We engineered our Flip Clean Conveyor with this in mind. The Flip Clean’s design allows workers to safely and easily remove the belt from the conveyor in order to properly clean the entire belt, leaving it sanitized and ready for use. This saves time in the cleaning process as well as maintenance. This tool-less design offers a variety of sanitation elements including belt rails for easy removal and cleaning, crevice-less bearings and belt wheels to eliminate bacteria buildup points and an open frame to enable easy sanitation and maintenance under the belt. 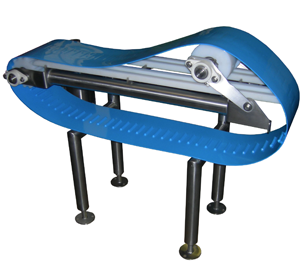 As with all our conveyors, the Flip Clean is completely customizable to fit every customer’s needs with options such as fabric belts, solid urethane belts, and more. Our focus on sanitation design will not only help eliminate the accumulation of food borne bacteria; it will also greatly reduce downtime for sanitation purposes and increase overall productivity.